ATTLEBORO, Mass. – For nearly 80 minutes, Attleboro continue to knock on the door, but couldn’t break through. And in a flash, just when it looked like the Bombardiers had a chance to find a way in, North Attleboro delivered a knockout punch on the counter attack, scoring the lone goal of the game in the 79th minute to secure its fourth straight Leach and Garner Cup. In the 34th addition of the rivalry game between Big Blue and Big Red, it was the hosts that had a lion’s share of possession, though not a tremendous amount of scoring chances. It looked like they might have something going with an attacking free kick late in the game. The service came in from the right flank but North Attleboro junior goalie Kyle Briere came flying out to punch the ball free. The Rocketeers quickly cleared the ball up field, where senior Joe Hilf did his job by holding the ball up right at midfield. That allowed North sophomore Matt Conley to come flying down the wing. Hilf played a ball in behind and Conley tracked it down. The sophomore delivered a hard cross to the far post where junior Alex Pfeffer connected on a one-timer. The shot bounced right off the ground and bounced over the outreach of Attleboro keeper Andre Mendard for the game-winning strike. 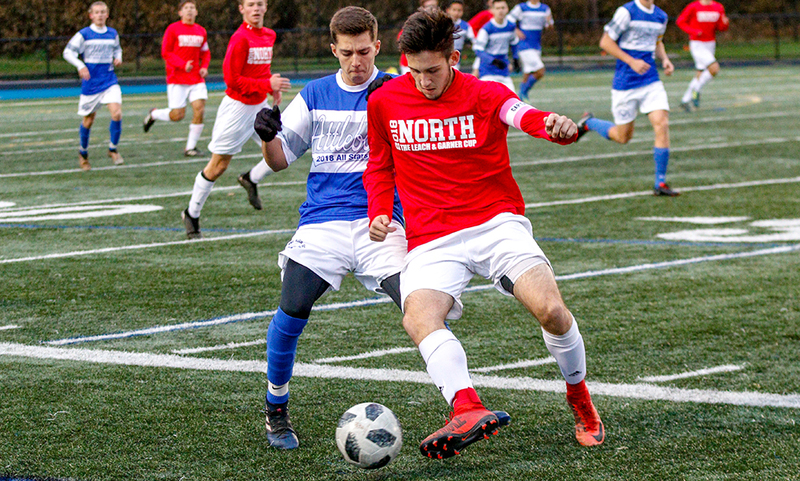 “When we started thinking about that situation was against Mansfield,” said North Attleboro head coach Geoff Burgess of the quick counter against opponents’ set pieces. “We knew when they go forward for set pieces, they push everyone but one defender up. And I think our chances with a 1-v-1 and if we get Matt Conley or one of the other guys on the outside running hard, not many teams are going to get enough numbers back in time. We hit Mansfield a couple of times with that exact situation so we started talking about using it more. Kyle knows when he comes out and catches a ball, find Joe and then everyone runs and we hit the counter. While playing the counter is a dangerous weapon for the Rocketeers, it allows their opponents to mostly control the game. And that’s exactly what the Bombardiers did. The challenge was the Attleboro couldn’t solve the Rocketeer back line of Remy Folan, Gavin O’Malley, Evan Rosenberg, and James Bush. 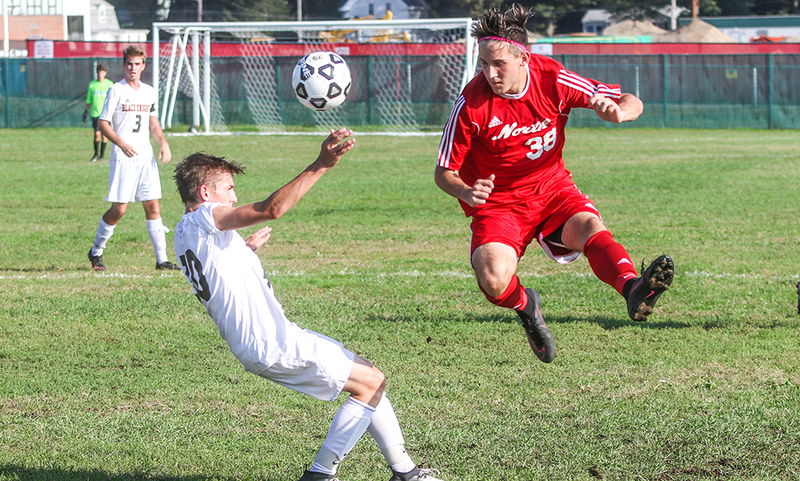 In the 18th minute, junior defender Josh Smith ventured into the offensive third and latched onto a cross from Colin Levis, but the difficult shot was wide. Six minutes later, the Bombardiers had their first bid on goal when Brady Holander placed a free kick from 30 yards out on frame but it was right at Briere. While Attleboro controlled the play, North Attleboro nearly stole the lead right before half. On a corner from Joey Coscarella, a low service was dummied before Hilf ran onto it and delivered a hard shot on frame. Menard, who was going the other way, made a diving save back to his left and made a one-handed save to keep it out. Hilf had another chance on the next corner but Menard pushed the header over the bar. While Hilf had a pair of chances to find the back of the net, it was ultimately his hold up play late in the game that led to the game-winning, something that the senior has worked on to add to his game this year. In the 63rd minute, Attleboro’s Aidan Lancaster saw his low shot from atop the area roll wide. North nearly countered an Attleboro corner in the 70th minute when Hilf played Matt Mordini in behind the defense by Menard came charging off his line for the clearance. Attleboro senior Will Halben had a bid saved by Briere in the 72nd minutes, and two minutes later Levis’ low shot off a corner kick went just wide of the post. 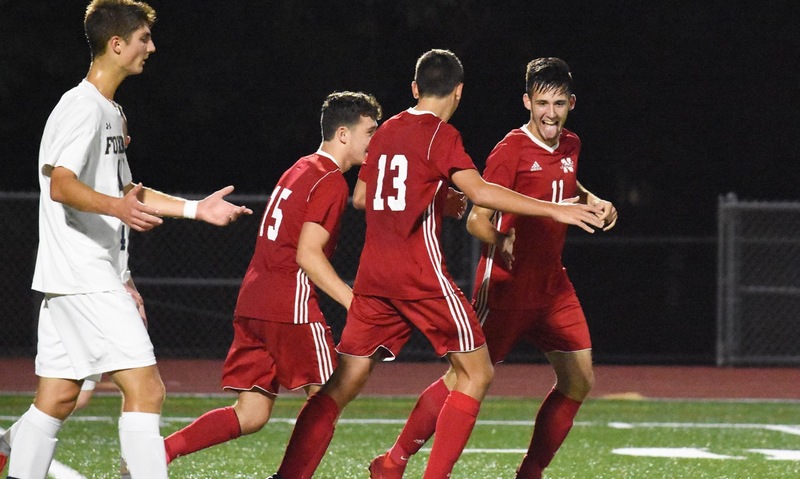 North Attleboro boys soccer (6-3-8 overall, 5-3-7 Hockomock) finishes the regular season at home against Sharon on Tuesday afternoon as it tries to improve its seeding for the D2 South bracket. Attleboro (5-9-3, 5-8-3) closes its season on Monday afternoon against New Bedford. Attleboro, 85 @ Sharon, 65 – Final – Attleboro hit 10 three-pointers as a team and had six players reach double figures in a big win over Sharon. The Bombardiers held a 39-35 lead at halftime but opened the third quarter with a 13-4 run to create separation. Attleboro outscored Sharon 23-9 in the third quarter. Attleboro senior Elvin Sam scored a career-high 17 points while sophomore Bryant Ciccio (seven assists) tied a career-high with 16 points for Attleboro. Dom Victor added 15 points while Qualeem Charles (seven rebounds), Nate Douglas, and Mason Houle each scored 10 points. Sharon senior Malik Lorquet led all scorers with 20 points. King Philip, 57 @ Canton, 66 – Final – Click here for a recap of this game. Franklin, 52 @ Foxboro, 54 – Final – Foxboro led by six at halftime (31-25) and extended that lead to as much as 15 in the second half but had to survive a furious late rally by the Panthers. Foxboro led 42-32 going into the fourth quarter but a 7-0 run from the Panthers cut the deficit to just four, 51-47, with 47 seconds left. Bobby Harrison hit a pair of free throws with 15 seconds left to make it a two-possession game. Matt Rongione scored a career-high 15 points for the Warriors while Joe Morrison added 12 points and sophomore Brandon Borde had nine points. Franklin sophomore Chris Edgehill had a game-high 17 points while junior Jalen Samuels added 15 points. Mansfield, 85 @ Stoughton, 60 – Final – After a close first quarter, Mansfield exploded for 30 points in the second quarter to take a 51-28 lead at halftime. The Hornets had their best defensive quarter of the game in the third, limiting the Black Knights to eight points to pull away completely. Senior John McCoy (9-for-11) scored a team-high 23 points, hauled in 10 rebounds and had three blocks, Khristian Conner notched a career-high 17 points (on 8-for-13 shooting) with seven rebounds and Justin Vine added 16 points. Stoughton senior Cam Andrews scored a game-high 24 points for the Black Knights. Taunton, 54 @ Milford, 56 – Final (OT) – Milford overcame a 12-point deficit in the final three minutes of the game to send the game to overtime, and then twice erased deficits in the extra period to earn the win. Milford junior Cam Falcon drained a three – his first career field goal – to give the Hawks the early lead in overtime. Taunton rattled off four straight to get the lead back, but two free throws from Milford put the Hawks up 53-52. Taunton scored again to take the but Milford once again sank two free throws to take the lead for good. Brendan White scored 10 of his team-high 16 points in the fourth quarter for the Hawks. Steve Sutherland added 12 points in the win for Milford. Taunton sophomore Dante Law scored a game-high 18 points while Lou Vendrell had 10 points for the Tigers. Oliver Ames, 44 @ North Attleboro, 59 – Final – North Attleboro raced out to a 12-1 lead after one quarter and never looked back. Big Red took a 27-16 lead into halftime and a 36-28 lead into the fourth quarter. Chad Peterson finished with a team-high 13 points, including three triples in the third quarter. Matt Seavey added 10 points and Evan Rosenberg, Josh Montague, and Jake Peterson all had nine points for the Rocketeers. North head coach Sean Mulkerrins praised the defensive work of Derek Shanks. Jack Spillane led the Tigers with 17 points. Sharon, 32 @ Attleboro, 48 – Final – Attleboro outscored the Eagles 14-3 in the third quarter to break the game open and earn its second straight victory. The Bombardiers were led by Sam Pierce’s 14 points and nine rebounds. Nyah Thomas added 12 points and nine boards and Jordyn Lake scored seven points, pulled down 10 boards, and dished out five assists in the win. Sharon was led by Emma Eberhardt and Evanjuline Elisma, who each scored 10 points. 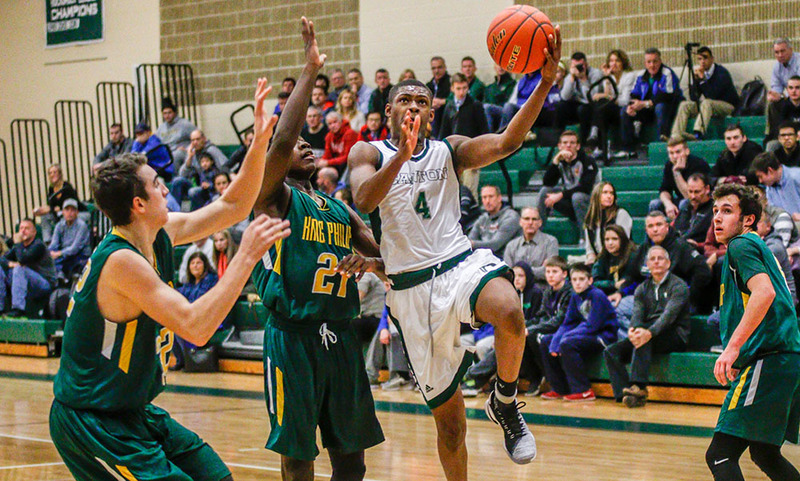 Canton, 59 @ King Philip, 54 – Final – The Bulldogs scored 21 points in the fourth quarter to rally for a road win at KP, only taking their first lead in the final minute of the game. Hannah Jerrier had a double-double for Canton, scoring 21 points and pulling down 15 rebounds. Erin Devine added 11 points and Maggie Connolly had 10 for the Bulldogs, who shot 15-of-19 from the line as a team. Foxboro, 64 @ Franklin, 33 – Final – Click here for a recap and photo gallery from this game. Stoughton, 30 @ Mansfield, 61 – Final – The Hornets jumped out to an 18-4 lead after the first quarter and never looked back to win a second straight game in the league. Meg Hill scored a game-high 20 points and grabbed 13 rebounds, while blocking four shots. Ann Maher added nine points and Maggie Danehy had eight for Mansfield. Val Whalen scored 10 points and Shyanne Trinh had nine in the loss. North Attleboro, 31 @ Oliver Ames, 58 – Final – Oliver Ames’ defense limited North Attleboro to just 13 points in the first half, taking a 28-13 lead into the break and never looking back. Kayla Raymond led the Tigers with 24 points while Alex Sheldon scored 11 points and Ally Scolnick had eight points. Julia Feid scored a team-high 12 points for North Attleboro.